Dimensions 13.2 In. X 13.5 In. X 44.0 In. I just got this vacuum today and I absolutely love it! Simple to put together and easy to manuver. The suction is amazing,my floors were filthy and I had no idea. I vacuum everyday and my carpet "looked" clean but after using the Bissell cleanview just one time the dirt cup was half full! It picks up everything even dust 😀 I most definitely would recommend this vacuum to a friend. I don't have animals so I'm not sure about pet hair but I do have 3 kids between the ages 5 and 12 not to mention a messy husband and this vacuum cleans up after em all! Honestly, I can feel the difference in the carpet, it really just feels cleaner under my feet! 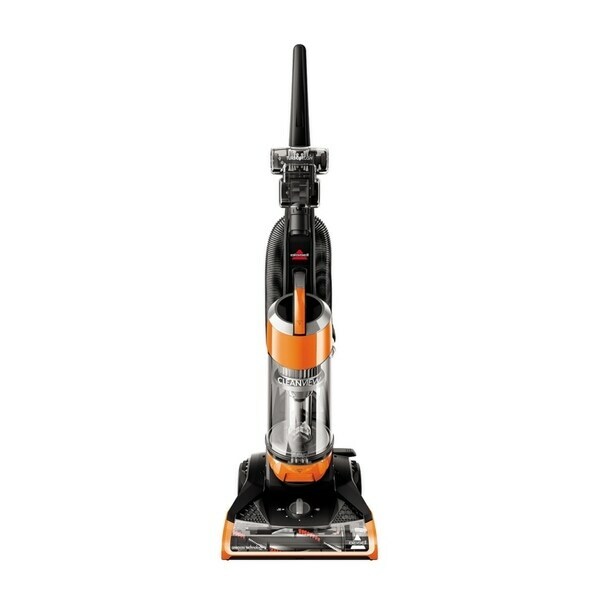 Great vacuum for a great price with great suction I would buy it again for sure! What a grand vacuum! Easy to assemble and comes with a special deep cleaning hand tool, extension pole and upholstery brush. Vacuumed my carpet and it lifts the nap beautifully - removing deep down dust with ease. Lightweight and easy to maneuver - with amazing suction. Easy to empty container and snazzy coloring make this baby a 10/10! Very happy with my choice. Works very well! Has great suction and moves over surfaces well. It has a decent size cord which is a plus. If you lift it beware as it has a bit of weight to it. Easy to empty and clean out. Has rubber bumpers on the corners of the vacuum so you wont nick your walls. Love the brush attachments. Nice upright for the price. Was easy to assemble. A little too heavy and short cord. All tools store nicely on unit and it does have a long crevice tool and Rotating pet brush. It is fairly noisy but does a decent job edge cleaning. Dial for floor height and bare floor adjustment is inconvenient; would prefer it up on top. It does deep clean DIRT and not only surface hair etc. Not crazy about the orange color but if it does a good job, who cares. This vacuum is "AWESOME" I always thought my carpets were clean, they look really nice, then when I bought this vacuum and used it on my "clean" carpets I just about filled the tank! It picks up animal hair that you can't see! The crevice tools work really well. I recommend this vacuum to anyone, especially if you have animals. Strong vacuum one push pick up. It is very lightweight and easy to carry around. The price is very good because i saw the same vacuum cleaner at Target and it was $20 more. Amazing... It's like I'd never cleaned my carpet before.. The room even smells cleaner I use 409 carpet cleaner and this vacuum and yaaaa , new carpet... Really. I highly recommend.. It's a little heavy but it's powerful.. Worth it. Great vacuum. Works well on carpet and hardwood. Would def recommend! Feels cheap, but works just fine. It is light in weight, easy to haul around. It is not ideal for stairs. I love the fact that I do not need to buy vacuum bags. Love it...it's so easy to use!! This is your basic vacuum no bells and whistles but it gets the job done great suction. Bought this for the kids to use because I did not want them breaking my more expensive vacuum. Ordered this after my Dyson died on my after 8 years and I wasn't sure how it would compare. Just running it over the rug in my bunny's room showed me just how much the old vacuum was missing- rather alarming but proved that this vacuum will meet my needs perfectly. "I much does this vacuum weigh?" We don’t typically outline “exactly” how loud our vacuums are. For this specific vacuum, I would say it is no louder than your typical vacuum. "How does it do on tile?" We do have people that use 1831 for tile but the it works best on carpet. "So many different models of this. What is the difference besides the cord rewind?" Best value, has everything needed and Bissell reputation.